Stumbling Over Chaos :: Linkity is taking a four day weekend, falalalalala! Linkity is taking a four day weekend, falalalalala! On breaking up with an author you used to love. Vacuous Minx with “RT 2015: The romance-industrial complex at work”. On Kurt Vonnegut. Kurt Vonnegut quotes. LEGO The Hobbit in 72 seconds. Word counts of the Lord of the Rings and Harry Potter books, to help you evaluate how long a fanfic really is. The comet landing as you’ve not seen it before. Tips from an architect on building a pillow fort. “Double spacing after a period could reveal your age“. Canadian Arctic Archipelago – that’s a whole lotta island names. 8 things that aren’t quite cats. Kids confused by a film camera. 15 quick & easy vegetarian dinners. 10 Thanksgiving vegetarian main dishes. Pork stew with white beans and butternut squash. 15 hearty slow cooker meals. “5 gluten-free alternatives to bread stuffing for Thanksgiving“. Apple pie in a bag. Pumpkin pie with praline and coconut-pecan crust. Tips for baking gluten-free cakes. 27 geeky scarves. (via The Mary Sue) I can’t believe they skipped the double-knit Star Wars scarf and the DNA scarf. Calvin and Hobbes in LEGO. Photo from the 1940 Armistice Day Blizzard in Minneapolis. Video of a road trip from NY to LA. Firefly Clue and Serenity Yahtzee. How can you remake Being John Malkovich without John Malkovich?! Pizza Hut has a lot of new options. Consumerist tries 21 variations. Doritos-flavored Mountain Dew. Stephen Colbert discusses the product. Peanut butter turned into diamond. Editing fail in a peer-reviewed journal. Cake Wrecks on Sesame Street. Black kitten! Black kitten! Margay and baby! Red panda and baby! Kitten! Kitten! Baby sea otter! Tiger and baby! 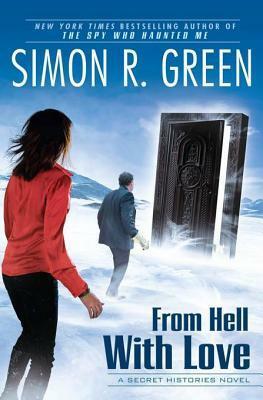 The Spy Who Haunted Me (Secret Histories #3) by Simon R Green. Ok paranormal thriller in which Eddie is teamed up with five other agents, who must work together and compete against each other to solve five great mysteries. The best part of this was Walker from the Nightside being one of the agents. From Hell with Love (Secret Histories #4) by Simon R Green. Ok continuation of this paranormal thriller series. I would’ve been severely annoyed about the cliffhanger ending if I hadn’t had the next book on hand. Posted by Chris on Friday, November 14th, 2014, at 2:00 am, and filed under Linkity linkity link, Reading, Reviewettes. 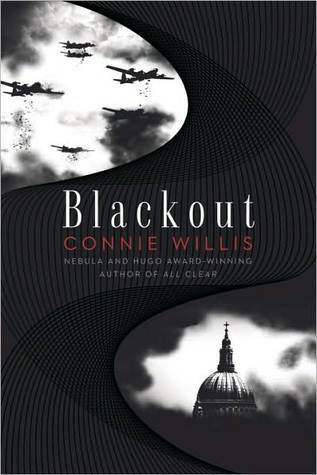 I loved Blackout and its sequel. My husband and I both listened to it on audio. It is very well narrated. It really picks up a lot of tension in book 2. I was practically biting my nails. The ending is very satisfying. Lucky you! I need a four dayer. Thank you for the quinoa/squash stuffing recipe! 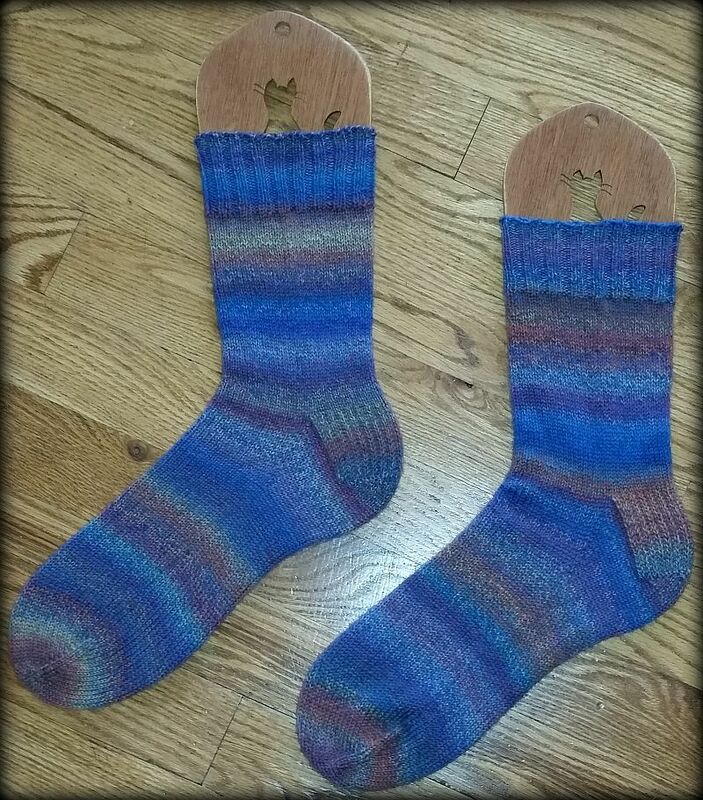 You knit socks? Serious? Chris- Mayhem approved Christmas socks- now those are special. 1. I quit double-spacing after a period about 20 years ago. Yay, me! B. You live with 2 cats and no other roomie. How many of your linked recipes do you actually make yourself? Inquiring minds want to know. iii. That XKCD animation is awesome. I sent it to Smokey, both sons, and my brother, the retired rocket scientist (he and his company figured out how to make the Hubble telescope not vibrate when it warms/cools as it goes out of/into the shadow of the earth). 5. I dare not show the VW microbus toaster to Smokey b/c he would want to replace our Cuisineart toaster STAT! I do hope those socks were for May! Or that he didnt pull any stitches!! 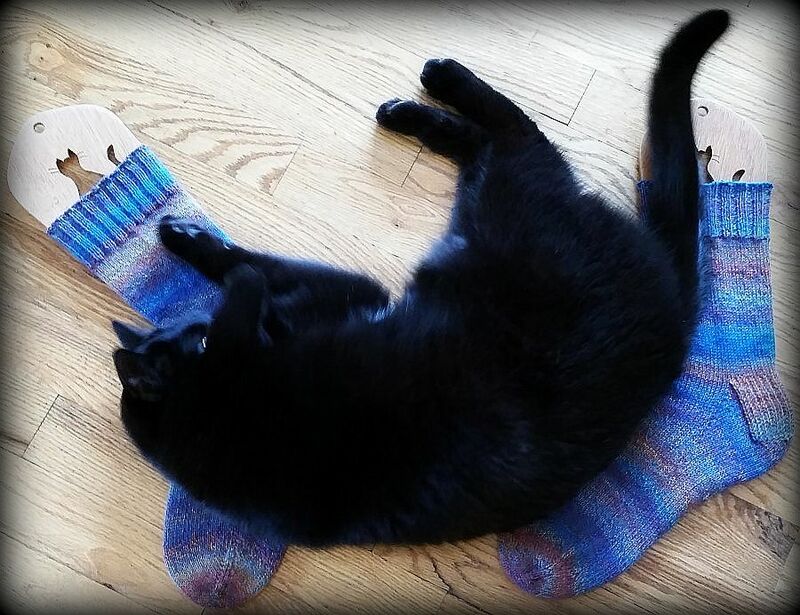 Those socks are lovely! I admire your skills and patience.